For America, is the best yet to come? The good folks at Seven Hills asked me to speak on a panel kicking off President Obama’s second term. It was an incredibly stimulating evening. Here’s a little write up of the event. They also produced a cracking video . 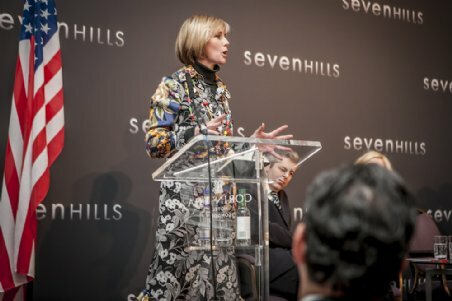 British American Project fellow Edie Lush featured on a high-profile panel last week, debating Barack Obama’s second-term prospects at an event organized by campaigning communications company Seven Hills. She joined a panel drawn from media and business, including Spectator Editor Fraser Nelson, Ariadne Capital founder Julie Meyer, Vanity Fair London editor Henry Porter, and BBC Radio 4 presenter Justin Webb. Second terms – like second mortgages, second marriages, and second trips to the salad bar – are seldom as gratifying as the first time around. An audience of over 100 witnessed the debate, which was rounded off by former White House economic adviser Dr. Pippa Malmgren, who pointed out the eye-catching fact that the US government could raise income tax to 100% across the board and still take 15 years to fully pay down its debt. This entry was posted in Events, Journal, Reportage and tagged Seven Hills. Bookmark the permalink.